Iranian women train in martial arts. Three thousand Iranian women being trained as ninja warriors say they will use their martial arts skills to defend the country if necessary. 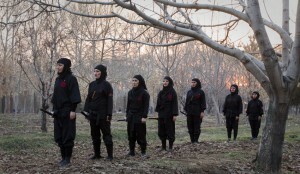 Scores of black-clad female “ninja” fighters whose ages range from 5 to 56 are just a handful of 3,000 women in Iran who are being trained as lethal warriors at a school in Tehran. “We train women to have strength and ability. We have to do everything in our power to protect our homeland,” said Akbar Faraji, who runs the school. Iran has proclaimed advances in nuclear technology, including new centrifuges able to enrich uranium, a move that has heightened its confrontation with the West over suspicions it is planning to make nuclear weapons. 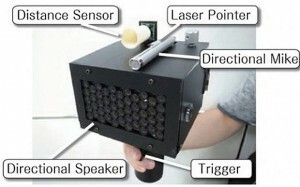 TOKYO | A device that silences incessant talkers or mutes people who talk too loudly has been created by Japanese scientists. “The system can disturb remote people’s speech without any physical [dis]comfort,” the scientists said in a paper reported in the MIT Technology Review. They said it could be used to maintain silence in public libraries and to “facilitate discussion” in group meetings. Japanese construction company Obayashi wants to build an elevator to space and transport passengers to a station about a tenth the distance to the moon. The elevator would use super-strong carbon nanotubes in its cables and could be ready as early as 2050, according to Tokyo-based Obayashi. The cables would stretch some 60,000 miles, about a quarter the distance to the moon, and would be attached to Earth at a spaceport anchored to the ocean floor. The other end would dangle a counterweight in space. The elevator would zip along at 125 mph, possibly powered by magnetic linear motors, but would take about a week to get to the station. It would carry up to 30 people. Up above, the space station would have living quarters and lab facilities. 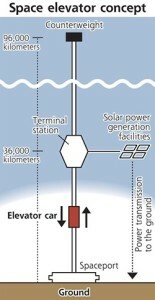 Solar panels connected to the station would generate electricity that would be transmitted to the ground. NASA has also investigated space elevators, awarding $900,000 in 2009 to LaserMotive for developing a laser-powered robotic climber. Aside from the tremendous technological hurdles involved, while space elevators could significantly reduce space-related costs compared with rocket launches, the infrastructure could cost billions to build. “At this moment, we cannot estimate the cost for the project,” the Yomiuri Shimbun newspaper quoted an Obayashi official as saying. b) Watch the video under “Resources” below. What do you think of the idea of Iranian women training in martial arts skills to fight against any invaders? b) How does the SpeechJammer work? c) Do you think the SpeechJammer is a good idea? (Who should or shouldn’t use it? In what settings would it be acceptable to be used? )Explain your answer. b) What is the major benefit, as well as detriment associated with the cost of the space elevator? c) Do you think Obayashi will be successful in their quest for a space elevator? Explain your answer. d) If you had the opportunity to take a space elevator to a space station, would you? Why or why not?